I woke up feeling a little delicate today and after getting ready for work then almost getting to the bus top, I had to go back home. I thought I’d feel fine after an hour but I didn’t so I curled up in bed for the rest of the day. 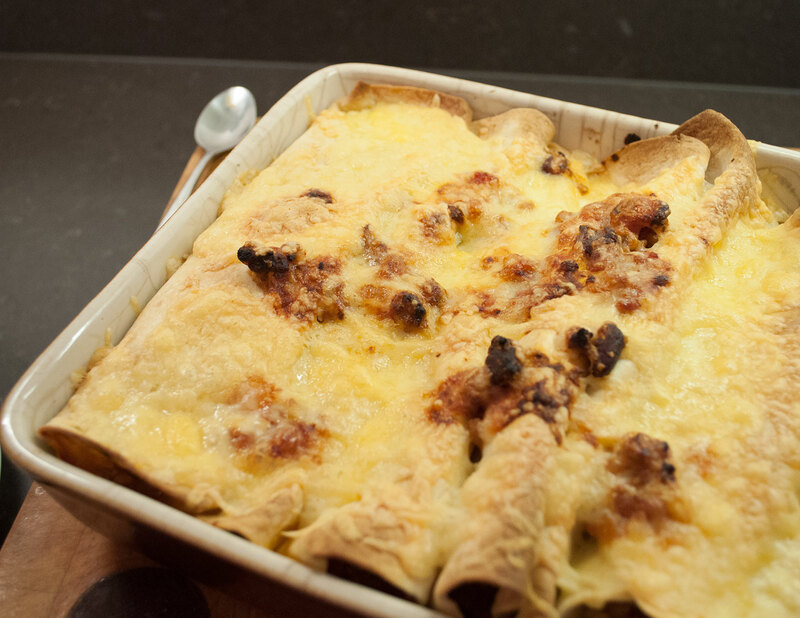 I still got up and helped Mr S make this but I didn’t eat much of it, which is a shame, as I adore enchiladas. Add the garlic, chilli, oregano and cumin and stir for a minute or so. Add the turkey and fry for five minutes, breaking up the turkey. Add the pepper, beans and the tomatoes along with a pinch of the sugar and some seasoning. Cook for 10 minutes then stir in the lime juice and coriander. Grease an ovenproof dish then add spoonfuls of the mixture to the tortillas, roll then place in the dish. As you add the next one, gently push them together. If you have any of the mixture remaining, pour into the pan then scatter the cheese over. Bake in the oven for about 15-20 minutes. This meal is adapted from this BBC Good Food recipe. On Saturday, luckily I was feeling loads better and luckily the sun was finally shining on the weekend. We took off on an adventure to Ladybower Reservoir at Bamford in Derbyshire. Walter is an absolute pro on the trains now. After not having eaten properly since Thursday I can’t say my appetite was back, even after miles and miles of walking. We ended up with an indoor picnic at home. The appetite came back with a vengeance on Sunday but I didn’t have the energy to cook so we had a kebab.